Plum brandy or Slivovitz is a Serbian national drink, one of the best and most exquisite brandies ever, which has been winning the hearts and souls of connoisseurs and laymen with its quality for centuries. 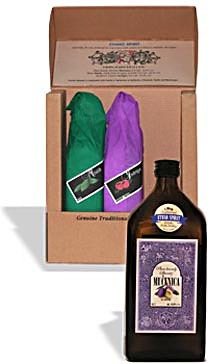 The plum brandy or Slivovitz, also known as Mučenica, was produced as early as 7th or 8th century from the selected types of plumes Prunus Domestica, autochtonous plum cultivars Crvena Ranka and Požegača, which was brought to this area from Turkmenistan by Slavs. In regions where plums thrived, every house made its own plum brandy and every house had its own secret recipe. That is why the brandy was named after the person who brought it – Mihajlo's, Nikola's, Milorad's, Stojan's... Plum brandy or Slivovitz has a very special place in Serbian customs and folklore. Even old coaches had a special place for holding bottles of Slivovitz. The poetry of its existence starts with collecting ripe plums and ends with maturing in oak barrels. This plum brandy is best consumed and appreciated as aperitif in afternoon hours or even better, evenings although many consume it for strength and good mood in the morning on empty stomach.